It's the kind of story that should be unreal, but it isn't. In 1914 Ernest Shackleton set off on an expedition with 27 other men. Their goal: to cross Antarctica from one side to the other (known as the Imperial Trans-Antarctic Expedition). Their ship was called the Endurance. It was supposed to take them through the Weddell Sea and land in Vahsal Bay where they would begin crossing the continent on foot. But it never made it that far. As it navigated the icy waters of the Weddell Sea, the Endurance became trapped in an ice pack. Unable to escape the floes, the crew wintered on the ship. They thought they would be able to get out in the spring, but the breaking up of the ice put extreme pressure on the ship and crushed her in October 1915. Up to that point, I was interested in the story, but in a half-hearted sort of way. Mike (who read the book a couple of years ago) kept asking, "Where are you now?" only to be disappointed at my slow progress. He finally said, "I guess it's just not that interesting to you." But with the loss of the Endurance, things picked up rapidly until I was the one badgering Mike about it and saying (over and over and over again), "This book is CRAZY! I cannot believe this ACTUALLY happened." Shackleton and his men survive on an ice floe for several months until it literally disintegrates around them (one of the more harrowing moments occurs when a huge crack opens up right under one of the tents in the middle of the night, and they have to find and save one of the men from the frigid water), whereupon they begin to navigate the treacherous Antarctic waters in three small boats. They alternate between being wet and frozen, nearly die of thirst, and navigate the majority of the time in the dark. When they finally make it to the uninhabitable Elephant Island, six of them leave for South Georgia for a rescue ship while the remaining men stay on the island with only the barest of supplies. The story mounts to an unbelievable climax. In fact, if the tale was fictional, I'm afraid I might have criticized the author for taking it a bit too far, leading the readers along to the last possible, the ultimate, second. But the whole thing is true, and instead of criticizing, I'm just awestruck. There was one point where Alfred Lansing tried to convey the futility of what Shackleton and two other men were about to attempt. He said, "Not one man had ever crossed the island for the simple reason that it could not be done." He wasn't being facetious; these men were literally attempting the impossible. As I was listening to this book, I kept thinking, How is it possible that I am a member of the same species as these men? How is it possible that we are breathing the same oxygen or that the same blood is flowing through our veins? It is incredible how much they were physically able to endure, but even more than that, I couldn't believe how well they kept up their spirits through the long ordeal, which I think is a testament to Shackleton's amazing leadership. They were castaways in one of the most savage regions in the world, drifting they knew not where, without a hope of rescue, subsisting only so long as providence sent them food to eat. And yet, they had adjusted with surprisingly little trouble to their new life, and most of them were quite sincerely happy. The adaptability of the human creature is such that they actually had to remind themselves on occasion of their desperate circumstances. One of the most tender moments for me was a scene that easily could have been left from the book. It was really rather inconsequential in the vast scope of the story, but I think it gives a glimpse into maybe why these men were able to survive with one another for so long. One day, Greenstreet (the cook) prepares their daily ration of warm milk. As he passes it around, his own portion gets spilled. He is devastated (when you have so little to look forward to, even such a small thing can be crushing). Instantly, several of the men pour a little of their own precious milk into his cup. That one scene really humanized the book for me--it not only showed that they were not immune to sadness and disappointment but also that they would band together to be kind and help out one another. Even though this particular moment had a real impact on me, Lansing filled the book with many similar examples. "They were breathless and their hearts were beating wildly, but they found themselves laughing uncontrollably. What had been a terrifying prospect, possibly a hundred seconds before, had turned into a breathtaking triumph. They looked up against the darkening sky and saw the fog curling over the edge of the ridges, perhaps two thousand feet above them, and they felt that special kind of pride of a person who, in a foolish moment, accepts an impossible dare and then pulls it off to perfection." I listened to the audio version of the book, and Simon Prebble carried out Lansing's words brilliantly. His voice rose and fell with the intensity of the situation (and there were times when I thought he couldn't possibly get any more animated, but I was wrong). He made each of the characters come alive with different and distinct voices. In short, he was the perfect narrator for this story. I fully intend on buying our family our own copy of this book. Even though my oldest child is only six years old, I've already started collecting ideas for when he is in middle school or high school and looking for new reading material. This is one book I want to have readily available and on our shelf. It is exciting and intense without being dark or disturbing. (I keep wanting to compare it to Unbroken, but where I wouldn't feel comfortable with a 13-year-old reading that, I would be completely okay with a 13-year-old reading this. Man vs. nature is infinitely easier to read about than man vs. man.) With a home full of boys, I have a feeling our copy will be quite battered and bruised in ten years. 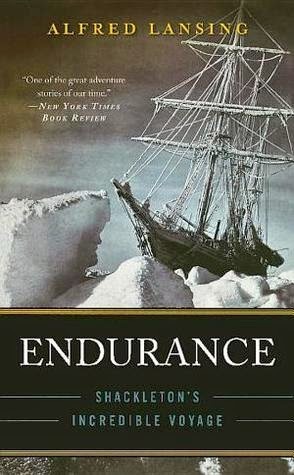 Early in the book, Alfred Lansing quotes this praise: "For scientific leadership, give me Scott; for swift and efficient travel, Amundsen; but when you're in a hopeless situation, when there seems no way out, get down on your knees and pray for Shackleton." Now that I've read this story, I can see why someone would say such a thing. Although not a perfect person by any means, Shackleton knew how to keep up morale and how to make impossible decisions. It was an unbelievable, but very inspiring, story. I love your thoughtful review and that it's about a book that's new to me. The milk story immediately reminded me of the picture book, Christmas Oranges by Linda Bethers. I couldn't find it in your book advent posts so maybe you haven't read it yet. Maybe you'll consider a post sharing the other books you're collecting for when your boys are older. (It's a selfish suggestions since my boys are a bit older than yours and I collect recommendations and books like crazy.) While public libraries are great (we even buy a membership to an excellent one as non-residents), there's something about being surrounded by great books you own. And I had to smile at your ending p.s. note. Thanks! That's a great idea for a future post! I have to admit that at the moment that "list" is more in the back of my brain rather than a physical list, but you've inspired me to actually start writing the books down as I think of them! One author that I've really enjoyed (and my 13-year-old nephews really like as well) is Malcolm Gladwell. His research is absolutely fascinating. You probably want to preview them before handing them off, but I think overall most of his stuff is fairly appropriate for kids who are looking for more challenging books. I can't wait to read this one! I hadn't heard of it before but it sounds so good. I love nonfiction books that are well done. Then you're in for a treat because this one is VERY well done! No, I hadn't heard of "Shackleton's Journey"! Thanks so much for pointing it out. I just checked and our library has a copy! I can't wait to get it. This has been on my list for awhile now. When I saw that you were reading it, I was so excited. I read "In the Kingdom of Ice" last year, which sounds very similar, and which I highly recommend. And I agree with Emily--I'd love to know what else is on your boys' future reading list. Unfortunately, my future reading list for my boys is still very much scattered throughout my brain. When I've actually formed it into a cohesive list, I will share! Oh, I'll definitely have to check this one out. There's a version of the story geared for elementary aged kids that I've read before (and loved!) called "Shipwreck at the Bottom of the World" by Jennifer Armstrong. Also, that quote by Lansing gives me chills. Armstrong quotes it at the very beginning of her book, as well. Good stuff. By the way, have you ever read Phineas Gage: A Gruesome but True Story About Brain Science? It's an incredible true story about a guy who had a tamping iron blasted through his brain and lived. Except his personality completely changed, which in turn changed the way many people thought about the brain, including scientists. Anyway, it's one of my favorite J Nonfiction books. It's still a bit too in-depth for my kiddos, but they have already pulled it out from time to time asking about the pictures. The skull on the cover is pretty hard to miss. It's one I would sell to boys in the library all the time.